» The Vice-President of India is the second-highest constitutional office in India, after the President. » The Vice-President acts as President in the absence of the President due to death, resignation, impeachment, or other situations. » The Vice-President of India is also ex officio Chairperson of the Rajya Sabha. » When a bill is introduced in Rajya Sabha, vice-president decides whether it is a financial bill or not. If he is of the opinion, a bill introduced in the Rajya Sabha is a money bill, he would refer the case to the Speaker of the Lok Sabha for deciding it. » Article 66 of the Indian Constitution states the manner of election of the Vice-President. » The Vice-President is elected indirectly by members of an electoral college consisting of the members of both Houses of Parliament in accordance with the system of Proportional Representation by means of the Single transferable vote and the voting is by secret ballot conducted by election commission. » The current Vice-President is Mohammad Hamid Ansari, since 11 August 2007, and re-elected on 7 August 2012. 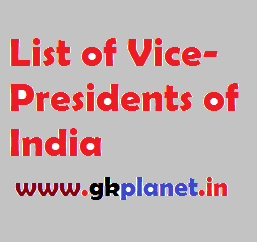 The complete list of Vice-Presidents of India includes the persons sworn into the office as Vice-President of India following the adoption of the Constitution of India in 1950.